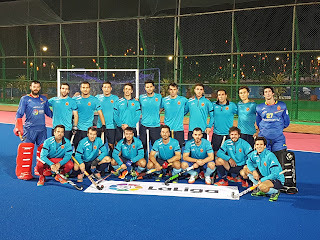 New Delhi 6th December 2017: LaLiga in India recently organised a friendly football match between Argentinian and Spanish national hockey teams ahead of the Hockey World League finals. Argentina, who sit top of the world rankings, and Spain, who are ranked ninth, will pit their wits against one another in the World League finals in Odisha on 5 December. Before then, however, they will be enjoying a kick-about, with Spaniards Miki Delas, Álvaro Iglesias and Sergi Enrique showcased their footballing skills up against Argentinian trio Mati Rey, Ignacio Ortiz and Lucas Vila. Argentina lost the friendly match to Spain by 3-2. The goal scorers from Spain were Miki Delas (2) and Álvaro Iglesias whereas Lucas Vila and Ignacio Ortiz scored from Argentina’s team.